Nice set, modern prints are hard to find in store now days. Decorate your nursery with this elegant crib bedding set from Sweet Jojo Designs. The cozy crib bedding includes a sheet, blanket and bumper to provide a soft spot for your baby to rest. Decorative and functional items such as window valances, a diaper stacker and a fabric toy bag, create a cohesive look for the baby's room. With a sophisticated palette in basic white and gray, this gender-neutral crib set works well for both boys and girls. Choose this simple design to coordinate well with other colors and patterns as your child grows. The durable 100 percent cotton fabric is machine washable and holds up to regular use. I ordered this crib bedding for my son's room and it looks great..just like the picture displayed. The grey is very true to color. The fabric wrinkles easily so after washing/drying it I sat for quite some time ironing everything. The fitted crib sheet is a little small and even when pulled taught is difficult to get under each corner of the mattress. 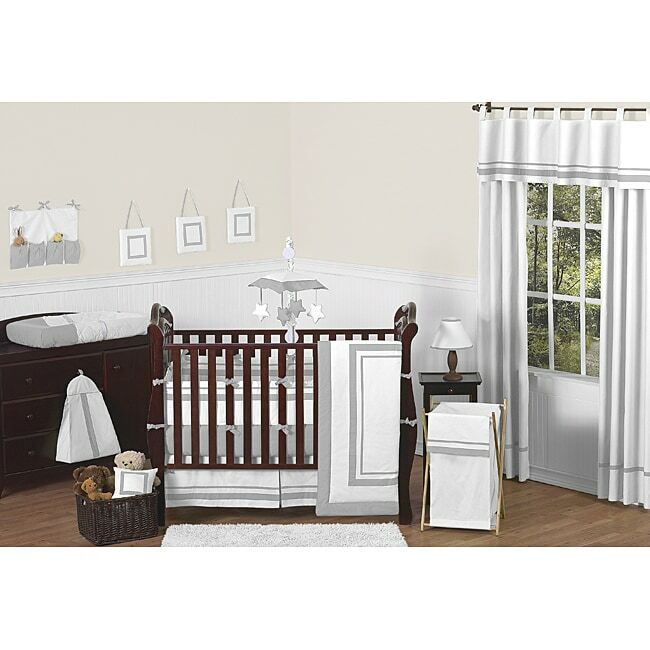 Overall I would highly recommend this crib bedding..for the price it is great and I have had nonstop compliments on the nursery bedding. I bought this for my baby's room...we are adopting a 1year old so I didn't want anything too babyish. My color scheme is grey and orange and this was a perfect addition. The product is well priced,well made and looks beautiful in my crib. I love the design of this. I didn't use the valance or toy holder. My son has this on crib and he is now 2. Def has held up nice. Very simple classic design. Matches with everything. Softens after a few washes. Set looks Great, But missing some things. The set was missing the Bed Skirt, and came with 4 window valences instead. So we altered the window valences to be a bed skirt. Overall set looks good but expected better for the price. I love this bed set. I think the grey in the fabric doesn't look cheap at all. It's a good solid grey which is what I was hoping for. It just looks fresh and clean. The quality of this product is not what I expected at all. I've purchased nursery bedding before, at a lesser price and the quality of the fabric was much better. I was expecting a 'hotel' quality fabric, and instead got 'motel' quality. We are not too pleased. Poor quality fabric. Everything shrunk on first wash...unfortunate. "Is it possible to just order the valance?" The valance is not currently offered separately. "Is there anyway I can mix and match this set? I am not wanting it all." Hi megan1030, unfortunately we do not have the option to customize the set. We apologize for the inconvenience. "Where can I purchase the curtains to match the valence?" Hello jillyc12. In the search bar enter in: "Sweet Jojo Designs curtains panels" and you will be given several options to choose from. Thank you for shopping Overstock.com; let us know if you have any additional questions. "What are the dimensions/weight for this product." Hello, kjl25. Hope your day is going well. The dimensions of this item are as follows: Crib blanket: 45 inches long x 36 inches wide, Valance: 54 inches long x 15 inches wide, Dust ruffle: 52 inches long x 28 inches wide, 12 inch drop, Fitted crib sheet: 52 inches long x 28 inches wide, 8 inch drop, Bumper: 158 inches long x 10 inches wide, Diaper stacker: 15 inches long x 6 inches wide, Toy bag: 14 inches long x 20 inches wide and Pillow: 10 inches long x 10 inches wide. The shipping weight of this item is 8 pounds. Thank you for shopping with us and please feel free to contact us again with any further questions. "How can we order the matching mobile?" Thank you for your question. I am sorry but at this time we do have the mobile. Have a nice day! "what is the thread count on the quilt"
The thread count for the quilt is 200.